The Marine Explorer workshop is an ideal way for children to learn about nature and the environment. 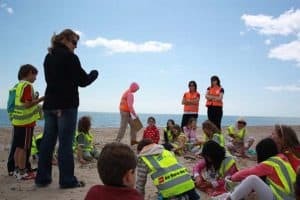 By basing our class on the seashore, children get an opportunity to learn through discovery and exploration, as well as being able to benefit from engaging group work and hands on activities in the field. Our qualified and experienced biologists will also be on hand to answer any questions that the pupils may have. With over thirteen years’ experience guiding schools on coastal field trips, we can also easily recommend a suitable location for your excursion. – An interactive talk with authentic marine realia, with props ranging from razor shells and crab claws to whale baleen and shark eggcases. – Tools for investigating the seashore, ie. fishing nets, crab and shrimp pots, field guides, worksheets, clipboards, magnifying glasses, buckets and spades. – Group work and team building activities, including a lesson on how to collect, record and identify living things on the seashore. – A lesson on how to recognise and identify animals and seaweeds that typify Ireland’s coasts. – Qualified marine biologists and environmental educators to answer all those awkward questions! – Participation in our citizen science programmes and marine conservation projects, including the Purse Search shark and ray eggcase sightings scheme. – SESE curriculum: Living Things, Environmental Awareness and Care. – Green Schools Programme; Theme 8, Global Citizenship – Marine Environment, Theme 3, Water and Theme 5, Biodiversity. – Discover Primary Science Scientific Awards of Excellence; Step 2, Visiting Scientist and Step 4, Explorative Activitiy. Suitable for all levels, Jnr infants – 6th class, including special needs. One workshop generally takes about 1.5 hours, ie. a 20-30 minute talk with realia followed by approximately 1 hour investigating the seashore. We can provide up to 3 workshops per day with a maximum of 30 pupils in each group. The bus and adult supervision of 1:10 needs to be organised by the school. If adverse weather conditions force us to cancel the field trip, we can run The Marine Experience as an alternative. If you have any more questions or would like to book a visit, please give us a call at 01 2828876 or email us at admin@marindimensions.ie. One of our team members would be delighted to help. You can also contact us here.